75th Birthday Decorations - Easy Decorating Ideas for a Fabulous Party! Every party needs a little bling – and I’ve found some lovely 75th birthday party decorations that will set a cheerful tone for your celebration! It’s not really all that difficult to decorate for a memorable party. Hanging a banner or putting up a sign in the front yard is a wonderful way to greet your guests. Add coordinating tableware and a few balloons and you’ve set the scene for a festive event! When I started looking for decorations for a 75th birthday party, I thought there would be tons to choose from. I actually didn’t find any pre-made decorations. Not to worry, though – once I got the idea to look for personalized party decorations, I was able to find several places to order decorations that can be customized for a 75th birthday event. Here are my top picks – just click on the picture to find out more details about each theme. Here’s a quick video (it’s under 4 minutes) that offers some clever decorating ideas for a milestone birthday party. One of the easiest ways to make your party stand out is to decorate with a banner that sets the tone for the party. Shindigz is my top pick for personalized banners. 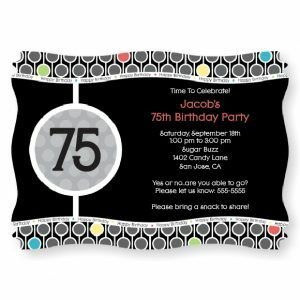 They offer a fabulous selection of personalized birthday party banners that can be customized to say “75th Birthday”. I especially like the photo banner pictured on the right, since you can show how the guest of honor looked at 3 different ages. They also have an amazing collection of themed party banners, which can also be personalized with the guest’s name and age. 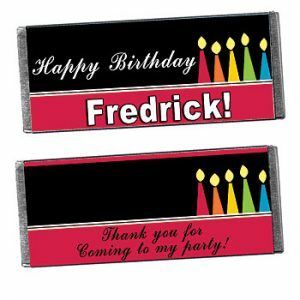 Prices start at around $15, so personalized banners are an affordable way to make a huge statement at your celebration. Obviously, you’ll need to serve beverages at your party – and personalized bottle labels are an easy way to add style to your drinks! 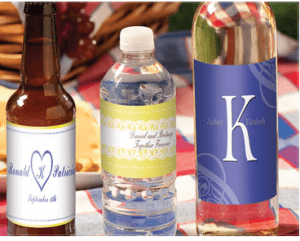 You’ll find a vast array of personalized bottle labels at Shindigz. 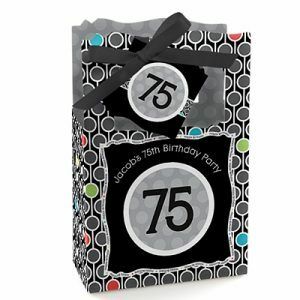 Choose from water bottle labels, wine bottle labels or beer bottle labels – any of which can be personalized for a 75th birthday celebration. If you’re having a themed party, you’ll find bottle labels in a variety of colorful themes. Look for the fun photo bottle labels – just upload a favorite snapshot of the birthday man or woman to create a sure-to-be-talked-about decoration! What’s a party without a bit of something sweet? Impress your guests by offering personalized candy treats at your celebration. Chocolate bars -choose regular size bars or miniatures. You can order just the wrappers if you’d rather, or choose milk chocolate, dark chocolate, dark chocolate with mint, or crispy milk chocolate. Lollipops – your choice of chocolate or candy swirl. Mint tins – includes small peppermints. Chewing gum slider packs – with sugar-free peppermint gum. A unique and charming decoration to greet guests with, or to let everyone know where the party is! Just upload a favorite photo of the guest of honor, and Shindigz will create a life-sized full color standee. You can have the image cropped to be the exact shape, or you can choose a rectangle. Combine it with a motion-activated voice recorder to greet your guests or provide directions at a large party. 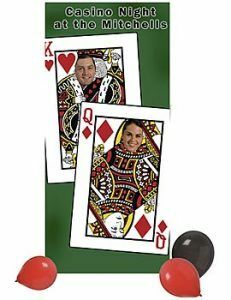 For a 75th birthday, it might be fun to order several of these with pictures of the birthday celebrant at different ages (at under $25 each, it won’t cost a fortune). Someone close can’t attend the party? They can if you create a life-size standee! 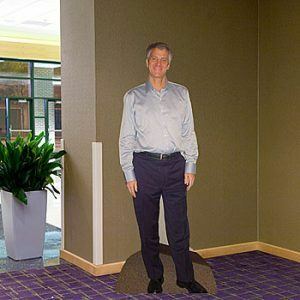 Be sure to take pics of everyone at the party with the standee and send it to the absentee guest. Don’t be surprised if the standee turns out to be the life of the party! It’s perfect for photo ops, starting conversations, and guests love to take them for a spin on the dance floor. If you want this party to be the talk of the town, then you need to start with first impressions. Your guests will be wowed when they walk through a personalized arch that perfectly fits the theme of the party. I’ve pictured the Paris arch on the left, but there are loads of other themes to choose from – cowboy, Hawaiian, disco, cruise ship, Hollywood and more. These oversized arches (up to 10″ tall) do require a little bit of work (and some extra hands), so be sure to allow extra time to set one up. Perfect for photo ops, and a sure conversation -an extravagant arch like this sets the stage for a memorable celebration! 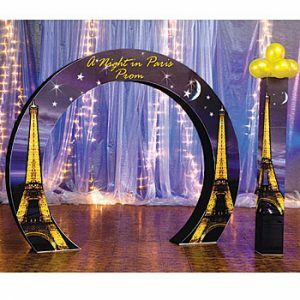 Party guests will love taking their pictures with the guest of honor in a fun photo stand in like the one pictured here. Shindigz has many different stand ins available; just pick your favorite theme. Some of the options include Western, motorcycle, 50s, Aloha, backyard BBQ – too many to list here! Some of the photo stand ins offer a single photo opening. If you opt for one with two photo openings, be sure to take a picture of everyone with the guest of honor – a great souvenir for everyone! I was amazed to find that theses are priced at well under $40 – a fairly inexpensive party centerpiece that will bring excitement to your party. If you’re looking for an easy way to decorate, it doesn’t get any easier than all-in-one party kits. 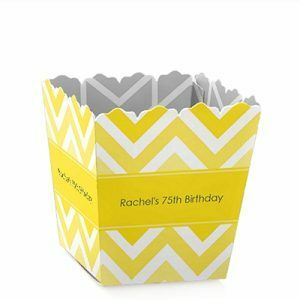 These party in a box kits have pretty much everything you need for your party – and they can be personalized to say “75th Birthday”. The kits vary as to what they contain, but they usually include banners, plates, napkins, invitations, and party favors. You can also add or subtract different items from the kits. Party planning really doesn’t get any easier! “Martha Stewart Look” Decorations – Without the Work! I love the simple but elegant look of Martha Stewart parties, but I would never have the time, talent, or money to put together a party like that. So I was thrilled when I ran across the elegantly understated collection of supplies at Minted.com. They offer sophisticated birthday party decorations, including 75th birthday bunting banners, table signs, personalized table runners, centerpieces, wine glass tags and more. 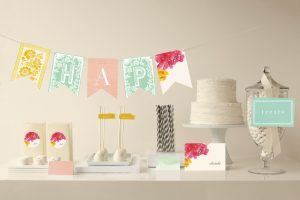 The charming personalized bunting banners, table signs, and matching confetti look to me like something Martha would do. And all you have to do is enter a few details on the computer – much easier! They currently offer over 20 different adult birthday party decoration themes, each with a unique style and color scheme. You can order coordinating invitations, so you can start your party’s theme at the very beginning. Minted also offers pre-made party packages – perfect if you’re in a hurry! These festive black and white decorations are a fun and stylish choice for either a man or a woman. These modern black and white decorations feature splashes of primary colors, so you can choose a black and white party theme, or add splashes of cheerful colors such as red, blue, yellow or green. You can choose individual decorations, such as a banner, invitations, matching plates and napkins, and party hats. They also offer matching party favors and bags, as well as personalized candy bar wrappers. I especially like how the site shows you coordinating candies and balloons – it makes planning your party so easy! Want even easier? Try their build a party kit. Just choose from one of 3 kits, each offering a varying level of party decorations, enter the number of guests (minimum is 16 for the kits) and you’ll have a complete party decoration pack ordered in just a few seconds. Personalized decorations and party favors add a touch of class to any gathering, whether formal or informal. These stylish chevron striped decorations are available in your choice of 6 colors: yellow, green, red, black, multi-colored, and purple – just pick your guest of honor’s favorite color! You can start out with either personalized or hand-written invitations, then continue with a complete array of party decorations. This cheerful theme is available in everything from banners to hanging decorations, plates, napkins, and coordinating placemats, cups and tablecloths. Send your guests home with matching party favors that range from treat bags and boxes, lip balms, candles, or personalized candy bars – they’ll enjoy the goodies long after the party is over. In a hurry? Check out the quick-order build a party kits – just 3 steps to order a complete party decoration package.